Do you blame others, blame circumstances, blame God, blame inequity or blame past sins for the circumstances in your life? How frequently do you feel sorry for yourself or feel like a victim? Who have you been depending upon for life choices? 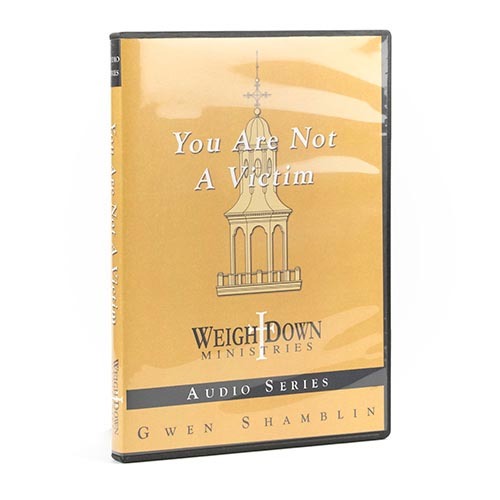 In this incredibly powerful audio series, Gwen Shamblin helps you change your victim mindset to one of personal responsibility. If you have felt the misery and pain of self focus and projection and are ready to put it to an end, do not delay in listening to the You Are Not a Victim Series! from Indialantic Life changing series!! The truth will set you free on self pity/victim thoughts. I didn't see this in me or the things I was running to instead of God until I listened to this- it showed me a root buried deep and since I've been free from these thoughts, I'm free from a cycle that kept me bound for years!! Praise God for this series!! from Colorado This series showed me how to be free!! Since a young age, I struggled with extreme shyness, depression, and self-pity. Over the years, I became increasingly introverted, scared, anxious, worried, and self-focused, and it destroyed so many relationships and opportunities!!!!!! In high school, I felt like I was drowning!! I was so stuck and didn't know how or why. This series opened my eyes to the root of all my problems, and once I fully put the lessons into practice, I felt like I had been born again!!! I had the tools to battle the self-focus, depression, anxiety, worry, pain, and self-pity, and I was able to overcome all those horrible and enslaving feelings and pressures!!! I am now the complete opposite of what I used to be, and I have TRUE happiness, joy, peace, and security, and I have renewed relationships with family and friends!!! Very grateful for this life-changing material from God! !